Coral reefs are the richest ecosystems on the planet. Giant formations built by some of the world’s tiniest creatures, these hidden worlds form tropical marvels that one has to see to believe. The biodiversity supported by coral reefs is greater than anywhere on earth, including the tropical rainforests. They form the largest structures built by any living thing, including man and no other realm can boast of as many species found in such concentrations. Corals, the animals that build these reefs, typically live in colonies with many individual “polyps” that secrete exoskeletons made of calcium carbonate, the foremost building material for coral reefs. Being exclusively tropical, corals naturally thrive in conditions of warm water and strong sunlight. Recently, however, the limits of their endurance are being pushed further and further. As a result, coral bleaching is occurring on local, regional and global scales with alarmingly increased frequency and severity on reefs across the globe. Bleaching of a coral is actually the reaction of coral to unfavorable conditions. The coral begins to expel the symbiotic algae (living within the coral’s tissue) which are responsible for producing up to 90 percent of its food. These algae are also what give the corals their amazing varieties of colour. By their elimination, the corals are effectively going on hunger strike. While coral bleaching can be caused by high levels of UV radiation, changes in salinity as well as bacterial and viral infection, the most universal cause of coral bleaching is increased Sea Surface Temperature (SST). Thermal stress is considered to be responsible for most large scale bleaching events around the world. Coral has a very narrow range of temperature in which it can survive, and changes of just a few degrees can cause bleaching. Several large-scale bleaching events have been documented at reefs around the world over the last two decades. This is important because significant declines in coral populations will ultimately lead to reef decay. This affects not only the corals themselves, but all associated flora and fauna which depend on the reef for food and shelter. Ritchie’s Archipelago in the Andaman Sea (a part of what we know of as the Andaman Islands) experienced a period of extreme thermal stress in 1998, 2004 and again in early 2010 with Sea Surface Temperatures exceeding 32oC, which is a coral’s upper temperature threshold. As a result, mass bleaching followed and vast areas of the reefs turned white, died and were subsequently overgrown by algae. Storms later destroyed dead reefs that were once resilient to the action of the waves – South Button was one of the most badly-affected reefs. Response to bleaching varies, but considering that corals grow only an inch or two a year, complete recovery will take decades. Despite extensive research into coral bleaching, there are very few usable data with which to predict the capacity of reefs to respond to changing environmental conditions. This is why a Reef Monitoring Program on the reefs in the Andamans is essential to the future of the region. Concern needs to be shown about the future of our coral reefs, in the face of predicted global warming and climate change. Current predictions suggest that bleaching events will become more frequent and severe with phenomena like El Nino exacerbating the effects of global climate change. Preservation of the remaining coral is critical to maintaining the species richness and diversity in the waters of the Andaman Sea, one of the few places in this country where we can experience firsthand what most people only see on television. The ultimate fate of corals in the region will depend on the capacity of corals to acclimatise or adapt to elevated temperatures. Recovery has proved to have been successful in North-West Australia and the southern United States and Caribbean. There are some documented species of coral in the Western US that can live in waters that are as warm as 38oC. No one has more exposure to tiny changes than people who dive the reefs every day. Divers see the change that most people don’t and for us, it’s especially personal, as these are reefs that we’ve discovered and which we consider “ours”. We have initiated a pilot project on a few reefs around Havelock Island to gauge the current state, recovery potential and speed of regeneration of the reefs in the area. Our work is designed to detect change in species richness and condition of the coral reef system. Of particular interest are changes in percent cover of live coral on the reef and at what rate recovery is progressing. With the data we gather, it will be a step toward determining the fate of our reefs more accurately. This allows us to learn from and influence the course of events rather than just being a spectator to the decline. We hope that we can collect some interesting scientific information which will improve our understanding of the dynamics of the coral reef and give us cause to be optimistic. Note: Due to spam, we’ve disabled comments to the blog. However, you can post comments on our Facebook Group. I know, it has been ages since we had a blog up here. I know some of you will snicker disbelievingly when I say I have every intention of being more regular. But until then, here is a change of pace. This article was inspired by a couple of recent Instructor Training Courses I have done, and some of the struggles faced by the new instructors in terms of adapting their teaching when faced with situations that the regular instructor training curriculum doesn’t cover. Hopefully, the structured approach to solving student difficulties and the tips contained therein, will be useful. Due to spam, I have disabled comments to blogs, but I’d love to hear your thoughts on the Diveindia Facebook group. Back when I first came and dived the Andamans in 2000-2001, there were a lot more sharks here. For example, Minerva Ledge used to be full of sharks – the question wasn’t whether you see any, but how many and how many species. Compared to back then, the number of sharks have decreased significantly. In fact, finding Johnny’s Gorge and Jackson’s Bar was a big morale booster for our team, as it showed that there still were some sharks left. 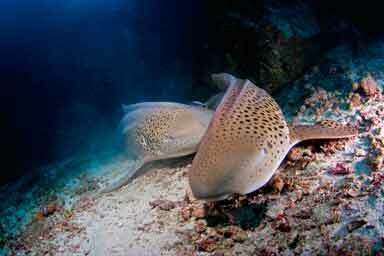 However, some positive shark news – this season, we have started seeing a lot more leopard sharks. I dont think I saw *any* leopard sharks in my first 4-5 years in the Andamans… and for the next few years, I think it was only a few sightings every season. But this season, they are regulars – we’ve been spotting them at Parr Ridge a lot, and also on Pilot Reef and South Pilot Reef. These are all sites that are accessible to divers of all certification levels and experience, as an added bonus! Back in 2002, I was teaching a class at Minerva Ledge with 3 Open Water students. Back then, there used to be a lot more sharks on this reef and the question wasnt whether we’d see any sharks, but how many and which species. As with most beginners, my students had some concerns about being in the water with sharks, and I gave them my usual spiel: sharks arent dangerous, we are not normal prey, we are too big for most sharks, etc. etc. I look, expecting to see a white tip and sure enough, there is one swimming towards us. I nod and return to scanning the front, as I am hoping to get a manta today. Then a small voice pipes in my head, saying “wait a minute – wrong proportions…” I look again, and the shark is coming toward us. Directly towards us. Fins down. Which is an aggressive territorial display. 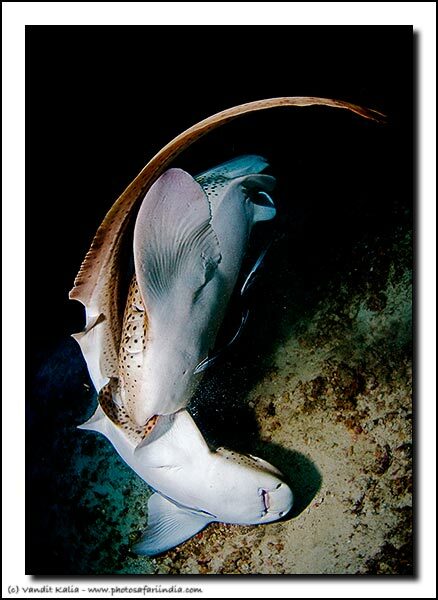 “Wait a minute,” I remember thinking, “where does a white tip get off being aggressive to three divers”? Right – when looked more closely, this shark just seemed to be a lot bulkier. And not only that, it was a lot bigger. And at that moment, it turned and showed us its size – it was a 4m+ bullshark! Yes, I know bullsharks don’t get bigger than 3m or so – but this was 4m+ and I will stake my diving reputation on it (heck, most people who’ve seen it put it at 5m+, but that is a bit exaggerated). And my divers and I had just been told off in no uncertain terms by Big Guy that we were in his territory. Rather than upset him, we turned around and head back in towards the reef, and that was all we saw of him on this dive. Over the next few years, Bob the Bullshark would make a reappearance a couple of times each season. Each time, it was at the same site and the same deal: comes straight in, fins down, in a territorial display, turning away a good 10m or so away. We always appreciated the polite warning and would make sure we didn’t hang around for a second pass (and certainly not the third pass, which might involve a “smile”). And each sighting was absolutely, gloriously epic – there are few things in this world as graceful as an enormous, powerful shark with rippling muscles and gliding by faster than anyone can swim with the merest flick of its tail. It was humbling and it was moving – we were witnessing one of nature’s 2 perfect creations in its element (the other being the crocodile) – and I mean “perfect creation” literally: the shark has not changed or evolved over 350 million years. It is perfect and cannot be improved upon. The last 3+ seasons, Bob has been AWOL. We put it down to him falling a victim to the local shark fishermen (thanks to the demand for turning this amazingly beautiful animal into soup). However, a couple of days ago, two of our divers and one of our DMs saw a big shark at a site that is about 250m away from Bob’s old stomping grounds. Initially, we were not sure whether it was a grey reef shark (which has been sighted here occasionally) or a bullshark (which has never been sighted here). Speaking to the divers and comparing notes on size, shape, etc., I am pretty confident it was a big bullshark. Could Bob be back? I for one certainly hope so – if there ever was a Christmas present that would thrill me beyond belief, this would be it. And at the risk of anthropomorphizing too much, I do wonder if somewhere in that predator mind of his, Bob remembers us? Welcome back, Bob – we missed you! Well, we are now officially starting our 5th season in the Andamans. 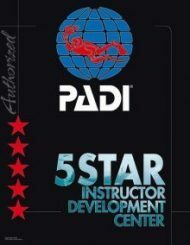 The first five years have been absolutely amazing – we’ve met some great people who have now become close friends, we have explored the uncharted reefs of this region and we have become India’s largest dive center without losing the personal touch that has been central to our operating philosophy. It has not all been easy, either. I have been diving for quite a while, but running a dive center is a completely different thing altogether. We have made mistakes along the way, but I take great pride in saying that we have learned from those mistakes and gone to great lengths to avoid repeating those mistakes. Every year, we are a better dive center than we were the year before, in terms of services offered to customers, safety procedures implemented and internal processes. If I had to pick one thing I am most proud of achieving, that would be it. I’d like to thank all our customers and friends who have chosen to dive with us. This year, we have a bunch of exciting new initiatives on tap – new destinations, speed boats, new resort, and more – and I will be posting regular updates on this over time. We thank you for making us the #1 dive center in India, and promise you that we will continue to innovate and offer ever-improving facilities to our customers.